Combined Artform has announced the world premiere of Blink & You Might Miss Me, written and performed by Larry Blum and directed by Stan Zimmerman, at the Asylum Lab in Hollywood. There will be two preview performances on January 6 and 7, with opening night set for Saturday, January 8 at 8:00. The limited engagement will run through February 6 only. Blink & You Might Miss Me is a humorous look back at Larry Blum’s personal journey in show business. Sharing engaging stories, rare clips and photos from his long and varied career, Larry illustrates the unique opportunity he has had to experience celebrity up close and personal. Whether dancing in A Chorus Line onstage, in the feature ﬁlm cult classic Xanadu or on TV’s Solid Gold, or acting on every major daytime drama, Larry’s love of the business is apparent. He also enjoys the honor of escorting the glamorous women of Hollywood as they ascend the stairs to the stage to accept various awards. Though his name may not be a household word, Blink & You Might Miss Me is his moment to take center stage. Larry Blum began his career in show business dancing in productions of I Married An Angel starring Phyllis Newman, Bye Bye Birdie starring Lucie Arnaz and How to Succeed in Business Without Really Trying starring Van Johnson. 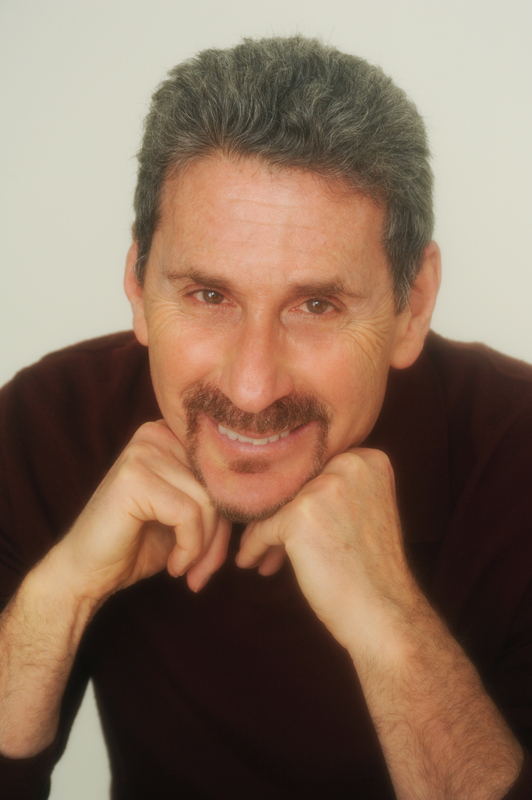 After playing the role of Greg in the international production of A Chorus Line, Larry settled in Los Angeles and danced on The Third Barry Manilow Special, The Bea Arthur Special, The Tonight Show, the Opening Ceremony of the 1984 Summer Olympics, The People’s Choice Awards, and Solid Gold. His ﬁlm credits include Xanadu and 18 Again (with George Burns), and he has appeared on the television series Roseanne, The Jeffersons, The Golden Girls, and The Garry Shandling Show, among others. Stan Zimmerman is a writer, producer, and director. With his writing partner James Berg, Stan worked on such classic series as The Golden Girls and Roseanne (penning the now infamous ‘lesbian kiss’ episode), both of which received WGA Award nominations for Best Comedy Writing. Other television writing credits include The Gilmore Girls, the Lifetime sitcom Rita Rocks (which they also created), and both Brady Bunch movies. 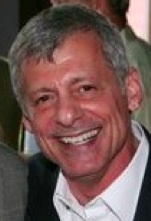 On his own, Stan his written for Emmy Magazine and starred in Situation: Comedy, a Bravo series produced by Sean Hayes. He made his stage directing debut with the 30th anniversary revival of Gemini at Celebration Theatre, followed by A Tuna Christmas at Theatre Asylum and Spike Heels at Actor’s Circle Theater. public relations. For more info, please visit www.combinedartform.com. Larry Blum’s Blink & You Might Miss Me will play two preview performances on Thursday, January 6 and Friday January 7, both at 8:00pm. Opening night is set for Saturday, January 8, 2011 at 8:00. The regular run will be Thursday through Saturday at 8pm and Sunday at 3pm. There will be no performances on Saturday, January 15 or Sunday, January 16. Tickets are $20 and may be purchased by visiting www.plays411.com/blink or by calling (323) 960-7612. The Asylum Lab is located at 1078 Lillian Way (one block west of Vine, just off Santa Monica Boulevard), in Hollywood. Casting is complete and rehearsals have begun for The Blank Theatre Company’s third production of its 20th anniversary season, Marc Blitzstein’s The Cradle Will Rock. Directed by The Blank’s Founding Artistic Director Daniel Henning, and featuring musical direction by David O, Cradle will begin preview performances on Saturday, February 5, 2011 and is set to open one week later on Saturday, February 12 at 8pm. The engagement will run through Sunday, March 20. Along with stage, television, and recording star Rex Smith, the cast (in alphabetical order) is Tiffany Adams, Will Barker, Gigi Bermingham, Christopher Carroll, Rob Roy Cesar, Matthew Patrick Davis, Mikey Hawley, Jim Holdridge, Jack Laufer, Roland Rusinek, Meagan Smith, Lowe Taylor, David Trice, Peter Van Norden, Matt Wolpe, Adam Wylie, and Penelope Yates. In The Cradle Will Rock, corporations and churches use their influence to shape laws to their favor, unemployment hits new heights, and millions of Americans are losing their homes. Sound like the new millennium? In 1937, Mark Blitzstein’s musical called these issues into question with his scathing satire of greed, corruption and politics in the U.S.A. 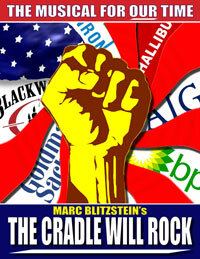 So scandalous, in fact, was The Cradle Will Rock that the U.S. Government tried to shut it down. But Blitzstein’s humor, music and agitprop parody ruled the day and the public got to hear this terrific, fun, jazzy score. Snappy tunes, wonderful characters and deep questions about our nation will take you on a roller-coaster ride through the American patriotic psyche. The Blank Theatre Company ﬁrst presented The Cradle Will Rock in 1994, directed by Henning, and the production received two Ovation Award nominations (Musical in an Intimate Theatre, Director of a Musical), three Drama-Logue Awards (including Production and Director), and the L.A. Weekly Award for Musical of the Year. Philip Brandes of the Los Angeles Times said, “Sophisticated, witty … Henning’s insightful staging and the inspired performances showcase the enduring brilliance of this under-appreciated watershed musical.” And in the L.A. Weekly, Martin Hernandez wrote, “Blitzstein’s fervent, catchy score and earthy humor complement the piece’s revolutionary politics.” A complete recording of the score was released by The Blank in 1995; that recording will be re-released in celebration of this new production and The Blank’s 20th Anniversary. Preview performances of The Cradle Will Rock are Saturday, February 5 at 8pm, Sunday, February 6 at 2pm, and Tuesday, February 8 – Friday, February 11 at 8pm. Opening night is set for Saturday, February 12 at 8:00. The regular performance schedule is Thursday, Friday and Saturday at 8pm and Sunday at 2pm through March 20. All preview seats are $30; regular performance prices are $30 on Thursday and Sunday, $34.99 on Friday and Saturday. Tickets may be purchased by calling (323) 661-9827 or online at www.TheBlank.com. For group sales, call (323) 871-8018. The Stella Adler Theatre is located at 6773 Hollywood Boulevard (2nd Floor), in Hollywood. Validated parking ($2) is available at the Hollywood and Highland complex. Continuing Fri/Sat at 8 and Sun at 7 thru 12/19. Dark 12/20-1/6. Boulevard), in Hollywood, 90038. Street parking is available.